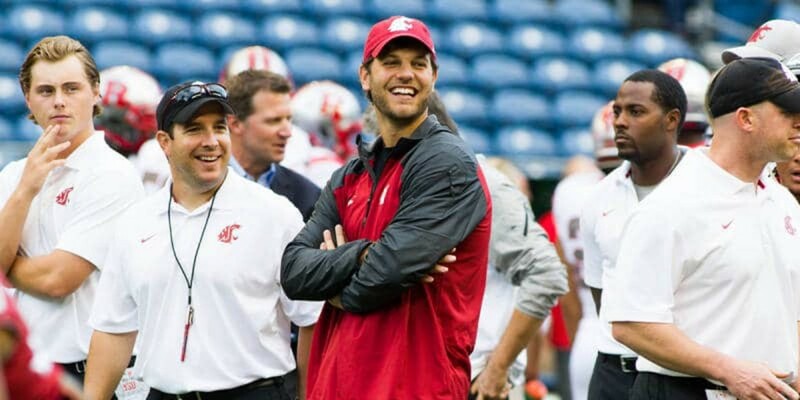 During his days as a quarterback under Mike Leach at Texas Tech (2005-2008), Graham Harrell threw for more yards than most of us have in our morning commute to work, and he currently sits as the #4 all time leading passer in NCAA history with an impressive 15,793 yards. Since his playing days ended after a few years with the Packers, and one year with the Jets, Harrell found himself in an offensive analyst role for on Leach’s staff at Washington State. This past off season, after Dennis Simmons left for the outside receivers job at Oklahoma, Harrell was promoted to coach the outside receivers for the Cougars. After wrapping up a career with over 1,400 completions (2nd all time), over 2,000 attempts (4th all time), and almost 16,000 yards in Leach’s offensive system, you just know Harrell knows the offense about as good as anyone. The other day, after practice, Harrell was asked about some of the changes or adjustments that Leach had made to the offense since the end of his playing days in 2008, and the answer Harrell gave was quite interesting. Harrell, in his first on the field coaching role, also touches on his coaching philosophy in the mic’d up session. “Our whole philosophy is that we’re going to be good at what we do, and we’re just going to be able to execute what we do better than you can execute what you do, and that comes with repetition.” Harrell explained.